Looking for a great abs workout? 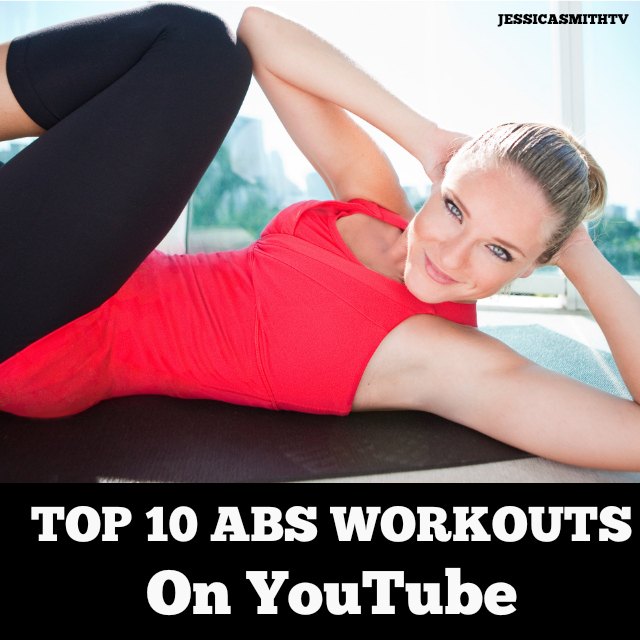 Check out these 10 videos below from JESSICASMITHTV (or click here to get the full playlist) and get to work! This short and sweet shot of abs is perfect right after a cardio workout or as an add on to some strength training, or simply as an abs break anytime of day or night! Blast off the belly fat with this full 30-minute workout that combines high intensity interval training cardio with standing abs exercises as an active recovery for maximum results. Hate getting on the floor to work your core? Then don’t! This full workout uses standing-only abs moves to whittle your waistline and create strong, flat abs fast! Have a ball while you work your core and more! This fat-blasting (and FUN) cardio routine incorporates the use of a small ball (a similar sized pillow works too) to amp up your abs while burning up tons of calories. Relieve belly-fat inducing stress with this yoga-inspired routine designed to target your core muscles for strong, flat and functional abs. Work all of the muscles along the waistline with these targeted Pilates style, equipment free, mat moves. Add a little weight to your abs workout with this routine that incorporates the use of dumbbells to add an additional challenge for your core and boost your calorie burn by working multiple muscle groups off the floor. Get rid of the belly pooch and create flat, firm, pulled in and strong abs with this targeted toning session! Great abs are made in the kitchen but strengthened and flattened with this workout. If you love Pilates but need a break from the mat, try this complete series of standing Pilates exercises. Want to try a few more? Check out our complete ABS WORKOUTS playlist here! And I’ve just found OCTOBER CLASS SHEDULE ! Amazing and precious !!! These are some of my favorite workouts! So effective for the abs and overall calorie burning too.